Ice Cream Social & Backpack run. Meet at Smith Crossroads in Lenoir (Chick-fil-A shopping center) at 12:00. Ride to CrossRoads Harley-Davidson in Wilkesboro to meet up with some more folks. Then ride to Ebenezer Children's Home for an ice cream social and to pass out backpacks. Ebenezer houses a variety of ages so we don't want to give teenagers crayons and coloring books or give kindergarteners hi-liters, so we are hoping that we can put together age-appropriate backpacks full of school supplies. A list will be available. Ebenezer is a great ministry that the Blue Knights, Red Knights, and Guardians of Children support at Christmas time and because we enjoy their fellowship so much, and did not want to limit seeing them only at Christmas time, we continued our partnership to create an ice cream social. Initially, we only charged an ice cream topping as the ride fee, but we ended up with so many ice cream toppings. What we are doing this year is just asking for age-appropriate school supplies. Interested in foster care or adoption? Our foster parenting classes will be beginning soon! Classes will start February 26th and will be held in Wilkes on the Ebenezer campus. Informational interviews will be held from 8:30-5:30 on February 13th. 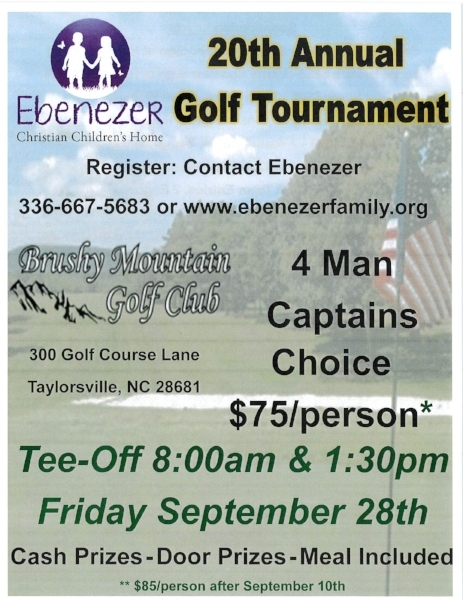 Call (336-667-LOVE) now or email Heather Cain (heather@egcch.org) to schedule a time or to get more information. If this day does not work for you, please let us know and we will work with you to find another time for your interview. Traditions Pottery located on Main Street in Blowing Rock will be hosting a give-back day. On September 8th, 30% of sales between 2-6pm will be given to Ebenezer Christian Children's Home. We hope you'll take this opportunity to support local artists while also supporting the kids! We are excited to announce our upcoming classes for Foster Care and Adoption services. One of the state requirements to become a licensed foster home is TIPS-MAPP (Trauma Informed Partnering for Safety & Permanence-Model Approach to Partnership in Parenting) classes. This is a 30 hour class. If you are only interested in adoption most counties we currently serve require that you take this class as well. We have scheduled MAPP to begin on Tuesday, April 10th. The classes will be held at Tabernacle Baptist Church in the Fellowship Hall located at 3929 Johnson Street High Point, NC 27265. Classes will be held on Tuesday and Thursday nights from 6:00pm to 9:00pm beginning April 10th. We will be providing a meal before each night of the training since most of you will be coming from work. If you are married, it is required that both spouses attend the class sessions. One of our requirements is that each participate complete an online training and print out a confirmation certificate prior to TIPS-MAPP class starting. This process should be less than 20 minutes. You can access this video at www.ncswlearn.org and click on Foster Parent Orientation. Husbands and wives may watch the video together, but each will need to print a confirmation page. Please bring the confirmation page to the first night of class. Once you have completed your application and completed the Foster Parent Orientation on line, please call our office to set up a time for an interview. Interviews will be done on Wednesday, March 28th from 8:30am to 5:30pm. If this date will not work for you, please let us know and we will try and work out another date for your interview. Please e-mail Kyla Kerr at kylak@egcch.org or Heather Cain at heathercain13@gmail.com to reserve your spot for the class. Should you have any additional questions, please feel free to call our office at 336-667-5683. 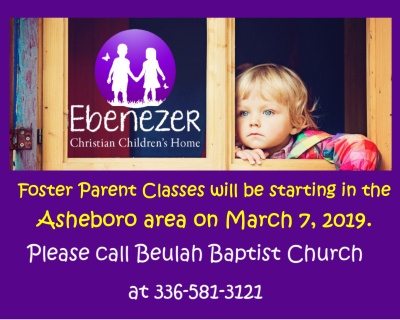 We have scheduled MAPP to begin on Tuesday, February 27 at Ebenezer Christian Children's Home. Classes will be held on Tuesday and Thursday nights from 6:00pm to 9:00pm. We will be providing a meal before each night of the training since most of you will be coming from work. If you are married, it is required that both spouses attend the class sessions. Once you have completed your application and completed the Foster Parent Orientation on line, please call our office to set up a time for an interview. Please e-mail Kyla Kerr at kylak@egcch.org or Heather Cain at heathercain13@gmail.com to reserve your spot for the class. Should you have any additional questions, please feel free to call our office at 336-667-5683.